Measuring Skylight Shades - BlindsOnLine.com Inc.
2) Determine whether the skylight shade will be mounted inside or outside the skylight. 6) Determine if you would like your shade to stack up or down. Inside Mount (figure A): For windows with 1 1/8” or more of depth an inside mount is recommended. For blinds to be completely recessed within the window frame a minimum of 2 ½” is required. If your windows are less than the minimum flush mount depths your blinds will project away from the window. Height- Measure the inside height in 3 places left, center and right. Supply us with the shortest of these three measurements rounded up to the nearest 1/8”. Factory will make no deductions. 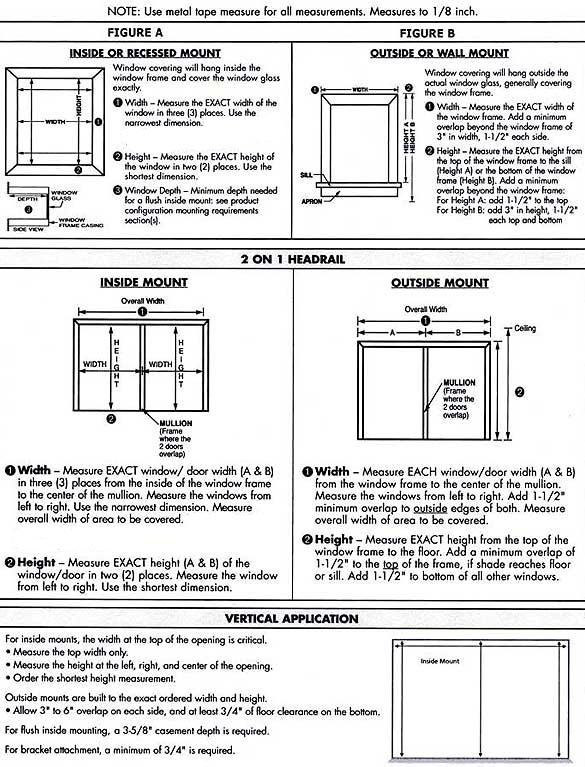 Outside Mount (Figure B): For windows with less than 1 1/8” of depth an outside mount is recommended. Width- Always use a steel measuring tape. Measure the width of the skylight, Add 4” to this measurement for overlap and to allow for a proper mounting surface. If there is not ample space on all four sides of skylight for mounting hardware an inside mount is recommended. Height- Measure the height from top to bottom in three places. Add 4” to the longest of the three measurements and supply us with that measurement. It our recommendation to mount skylight shades inside the frame whenever possible.